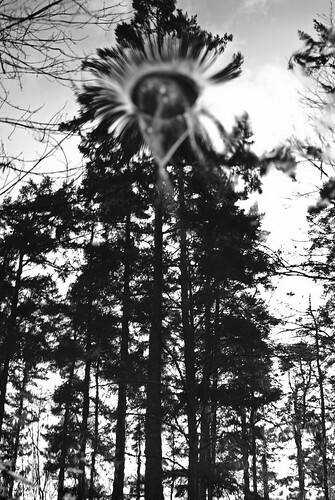 Shattered Reflection, originally uploaded by omiala. Took me over 5 years to understand how difficult it was and how lucky I was to capture such a shot. At first glance, it’s difficult to understand what is going on in this photo but try to figure it out for yourself . Awake, Shower, Eat, Coffee, Study, Coffee, Study, Eat, Coffee, Study, Eat, Study, Try to Sleep, Stress, Write Blog Post, Sleep. 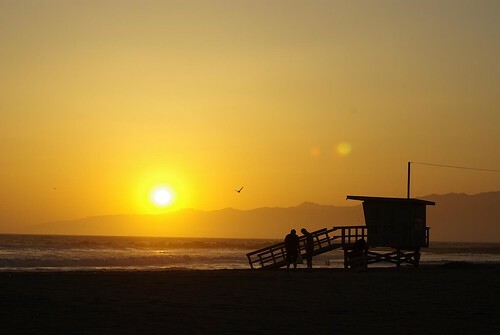 It’s been a while since I’ve reviewed my California photos taken last April. But I found a gem. I remember taking a series of shots atop 2140 Taylor St. which would give me a 360 degree view of San Francisco, well at least the Nob/Russian/Telegraph hill part of SF if stitched together into a panorama. Photoshop is currently crunching the numbers to stitch a whopping 19 photos together. Ah great. Spinning wheel of death – Photoshop is not responding. Let’s retry that with just 16 images, and hope Vista doesn’t freeze again. I tried to stitch the images together back in the summertime, but my Coreduo Macbook Pro with only 2Gb of RAM just could not handle the task. I forgot about the panorama since, and now that I’ve returned to Ontario, and also to my desktop computer containing a significantly faster processor and much more ram, I think I’ll finally be able to stitch the photos together. Success! Photoshop stitched the photos using Photomerge in a blazing fast 155 seconds! You’ll notice a few images are blurry due to my excitement of having such an awesome viewpoint. Next time i’ll try to focus more on taking the picture, but nonetheless, Photoshop still managed to stitch the photos perfectly. I’ve returned back to Waterloo for another school term, and I’m looking forward to a good term! 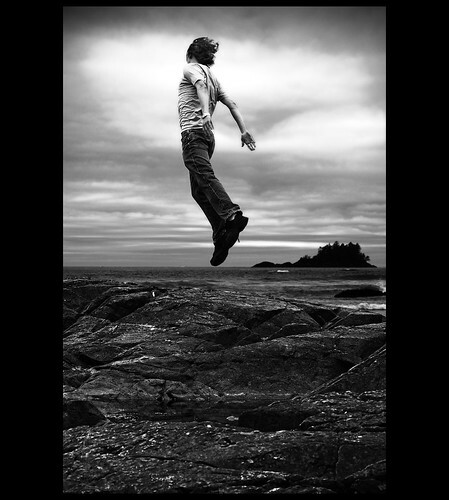 During my summer, I jumped across the border to Washington State with a friend Max to camp in the Olympic Mountains and just generally be a tourist. Apart from seeing some rather gorgeous sights, I had been looking forward to sitting back in a camping chair in front a fire with one of my favourite American beers I discovered while in California back in April 09′. 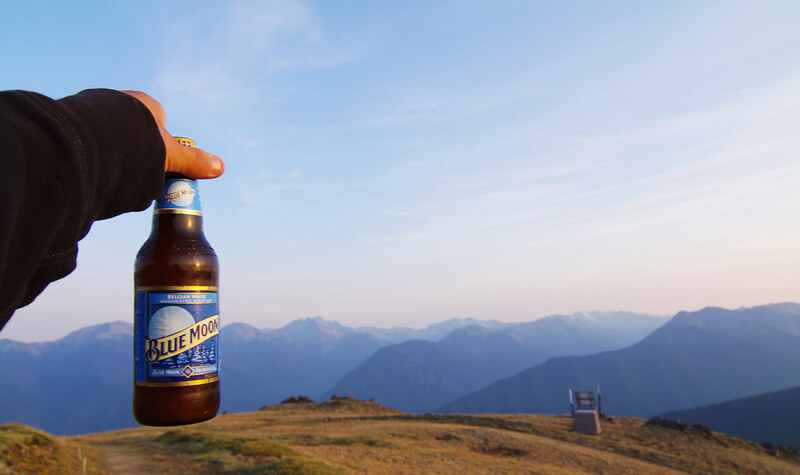 That beer, as the title foreshadows is a belgian-style wheat beer (witbier), called Blue Moon. 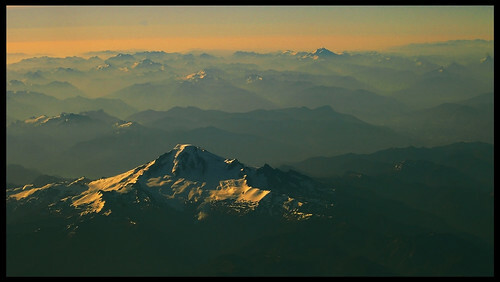 The picture below was taken at the 6000 foot summit of Blue Mountain in Olympic National Park. I hauled 24 bottles back to Canada. That’s when I found out. 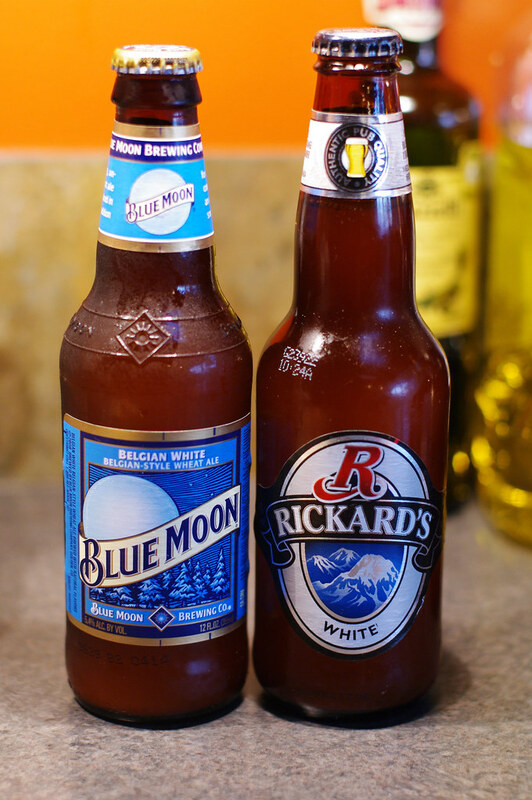 Blue Moon is marketed as Rickard’s White in Canada. Ilya mentioned his roommate, Dan Armstrong, who also co-writes the beer column ”The Brew Man Group” for The Iron Warrior, informed him a beer called Blue Moon is Rickards White north of the 49th. I couldn’t believe it, yet, after a quick google search, evidence poured in confirming this rumour. Both beers weigh in at 5.4% and are brewed by the same company (Molson Coors). Ilya arrived in Victoria soon after, and along with my friend Max and his parents, we held an informal blind taste test. Ilya volunteered to moderate the first round of the test. Each taster received three numbered glasses – one contained one beer, while two contained both of the second beer. The primary goal of the test was to be able to distinguish which two out of the three glasses contained the same beer. The secondary goal was to determine which beer (Blue Moon or Rickard’s White) had been poured in each glass. Sight – At first, I looked at the colour of each beer, and noticed two out of the 3 had the same colour while the other appeated slightly darker. Smell – No noticeable difference in Aroma. Taste – Like smell, I could not distinguish noticeable difference in taste. From my obvervations in taste and aroma, I could not distinguish between the two - I based my conclusions entirely on the colour difference. View the picture above of the three tasting glasses keeping colour in mind. Notice glasses 4&5 are similar while 6 is a tad darker? From this, I concluded 4 & 5 were the same beer, while 6 differed. Also, I decided Blue Moon was poured in 4&5 and Rickard’s in 6. 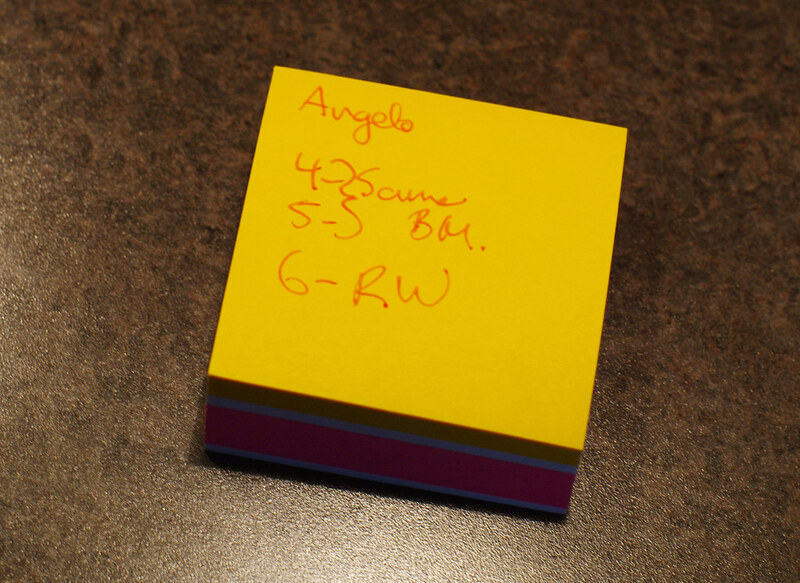 I wrote my findings on the following stickie. Well I was right about my colour hunch. The contents of 6 did differ from the other two; however, I was completely wrong with my blind guess on which beers had been poured into each glasss. Rickard’s white had been poured in 4/5 while Blue Moon into 6. None of the others tasters correctly identified their two glasses of the same beer, and thus could not also correctly guess the contents of each glass. 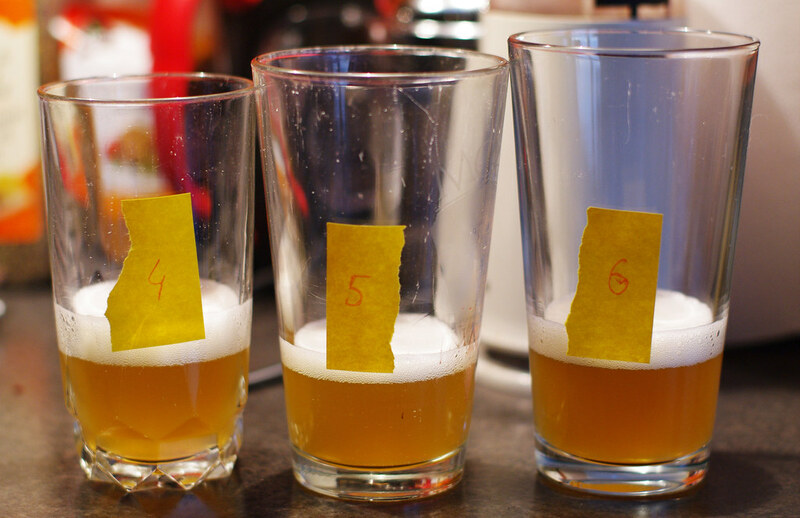 In the case of Blue Moon and Rickard’s White….When presenting tasters three glasses of beer, where two contain the same and the remaining glass contains another, 4 out of 5 tasters cannot distinguish which two glasses contain the same beer, thus Rickard’s White and Blue Moon are the same beer. 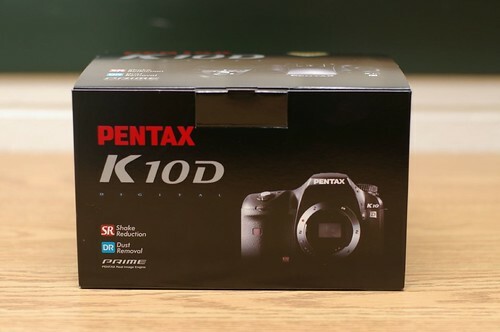 Remember in my last post how I mentioned my K10D was a perfectly good camera? I suppose I should have knocked on wood. After reaching our final destination, and highest lookout on the afternoon hike within Gowlland Tod Provincial Park, I proceeded to take shots as normal with the camera. I took about 20 shots that I later plan to stitch into a panorama. There was no sign of the impending failure as the camera worked and sounded as it always has. I then took a picture of an uninteresting tree to test the focus on the camera with the DA* 50-135 f/2.8 attached with no issues; however, when I went to recompose the shot – nothing would happen. The lens would focus, the confirmation beep would sound, but depressing the shutter button resulted in no response from the camera apart from a slight odd whirring noise. My first thought after struggling through mild confusion? Great. My second thought? Looks like I’ll be forced to upgrade after all. Funny though. Every DSLR I’ve owned so far has broken down a mere month or two before I planned to upgrade. My first DSLR – a Pentax *istDL decided it no longer wanted to raise it’s mirror a couple weeks after the K10D was announced in September 2006. Fast forward to 2009, less than two weeks after the K-7 announcement, my K10D decides it no longer wants to raise the shutter. Pentax recently replaced the main circuit board, sensor and lens mount in Dec 2008 and the tail end of the 2 year warranty. Unfortunately, the repairs are only warranted for 90 days which has long ago passed. Shame. I had looked forward to using this camera as a backup, but now I am left with a paper-weight that is likely not worth fixing. 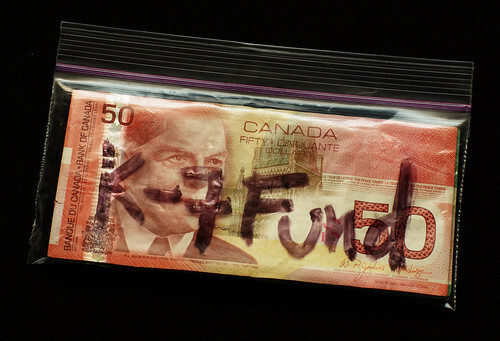 Pentax K-7 Fund, originally uploaded by omiala. Already almost a month since my last update. I have already failed at this whole blog thing. Anyway, I’ve decided that I will replace my current camera with the newly released Pentax K-7. My less than three-year-old K10D is a perfectly fine camera that is still fast and great to use. So what lead me to this decision? I’m getting tired of being apprehensive to use ISO 800 and heaven forbid ISO 1600. If it is anything like the K20D, noise will be controlled at 800 and bearable at 1600. 3 FPS hasn’t met my needs. Even ever since I still shot with the *istDL’s measly 5 shot buffer, I have lusted for at least 5 FPS. Ever since seeing the quality and amazing DOF of some friends 5DmkII’s, I’ve been wanting to see how the FA limiteds will perform with video. Could be a gimmick for me, but I’d love to try it out! The K-7 is in my eyes, rediculously small – especially with it’s feature set. Since I’ve finally settled into a kit of lenses that I’m comfortable with, I’ve been trying to reduce the bulk and weight of my bag. 5.) 3″ High Res LCD. Ever since I used Matt Manjos’ Alpha A900, i’ve been amazed by the usefulness of a high res LCD on the back of a DSLR. Without zooming into the photo on the display, one can easily check for the correct focus. There have been MANY times where I belived a scene was in focus when checking the rear LCD, but much to my dismay when I get on the computer, I was wrong. On the flip side, what I will miss from the K10D? At this point, its too early to tell if I will actually miss it, but its something I have used extensively. Easy, convenient, and quick. Three brilliant words to describe having an extra memory card on hand without having to dig through your bag. I suppose you suffer convenience for compactness. EDIT: Looks like the D-BG4 grip for the K-7 will be able to store another memory card as long as you are using the lithium battery insert and not the one for AAs. Of course, image quality is most important, and will not be known until production cameras make it out into the world, but I have my trust that Pentax has their act together on this camera. Two Flights, Two Train Rides and 1700km by road. It’s time for me to relax for the few days before work starts. My trip, albeit short, was very satisfying. I accomplished the Majority of the sights/ typical touristy things as I had planned. My trip began in San Francisco after a short trip from SFO aboard BART to a friend’s place in North San Francisco. The view of San Francisco Bay was astonishing – Panoramic views of the downtown skyline and the bay reaching approximately 270 degrees. We even had roof access, so I grabbed some shots to later make into a panorama. After the sun settles and photographing was no longer possible, we met up with many Waterloo Co-op students (approximately 9) and went out for dinner in Little Italy at a restaurant that claimed to be Sicilian. I wish my Italian was a lot better than it currently is so I could speak a few phrases to the guy who lured us into the restaurant with his seemingly forced and fake Italian accent. After a bright and early 8 am wake up, we grabbed our rental from Enterprise who, contradictory to their statement “We’ll pick you up” denied to do so and told us to take a taxi to the depot. 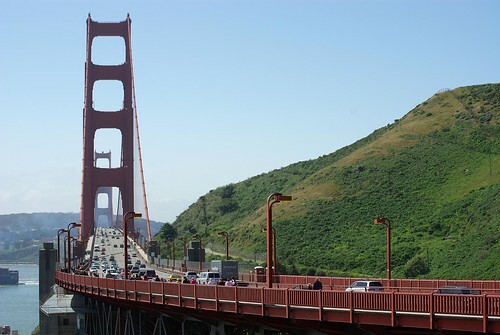 We picked a very plastic Dodge Caliber, and immediately set a course for the Golden Gate Bridge. We commented on the terrible build quality of the Dodge and said things like, “no wonder Chrysler is in so much financial trouble, this car is a POS!” Ironically, one of the first articles I read online after returning just happened to be this one which comments on the how the Caliber is one of the cars that sunk Chrysler. After driving across the bridge, taking pictures and a toll of $6, we hit the Bay Bridge to head to LA. I manned the steering wheel first and I must say, it is a VERY long drive to SoCal. We reached our hotel sometime after 5 P.M., temporarily met up with some more Waterloo Co-ops, this time from San Diego, and then hit up Venice Beach just north of Santa Monica. Even though we brought our beach gear, we arrived way too late as the sun was already half set in the sky. The others went out that night, but I was much too tired, and passed out around 12 pm. 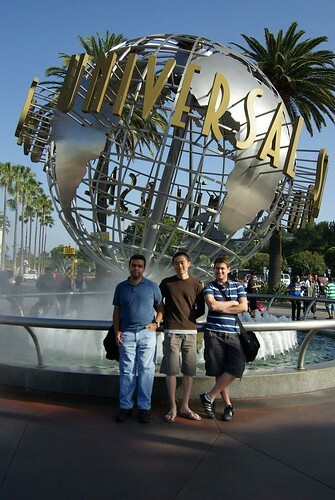 The next day, we checked out of the hotel around 10 AM and immediately went to Universal Studios Hollywood. I’m not really much of a fan of Theme Parks, as they tend to be severely overpriced and crowded, but luckily on a Sunday, it was practically devoid of people. In fact, many of the wait times for the rides were under 10 minutes. The “famous” studio tour wasn’t very entertaining at all. 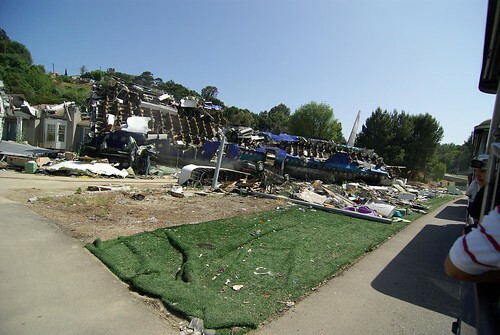 The only thing worth looking at on that tour IMO, was the war of the worlds set. Seeing aircraft fuselage and parts scattered across seemingly nice houses is a nice change of landscape even if it’s fake. Enough of the complaints. The other rides didn’t disappoint. The Simpsons Ride, Jurassic Park, and the Mummy were absolutely entertaining – in fact, we rode Jurassic Park thrice just for the final drop! 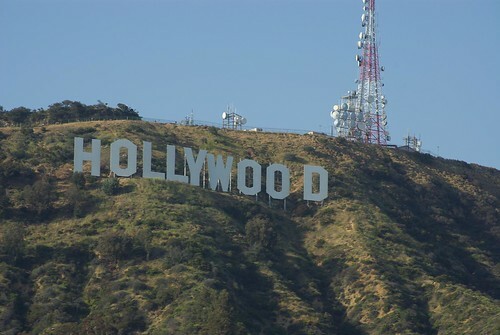 After Universal Studios, we hit up the Hollywood sign for a little photo shoot (of course) and also the Hollywood Walk of Fame. We did not stay long for the walk, but enough to take a few photos, grab a coffee, and empty our bladders. Afterwards, we drove 2 hours to San Diego just getting in past 9. We once again met up with more Co-ops and shared a few drinks before settling for the night. Before the near 8 hour drive up to Cupertino, we visited a gorgeous beach on Coronado Island, and had lunch with waterloo Co-ops working in SD. 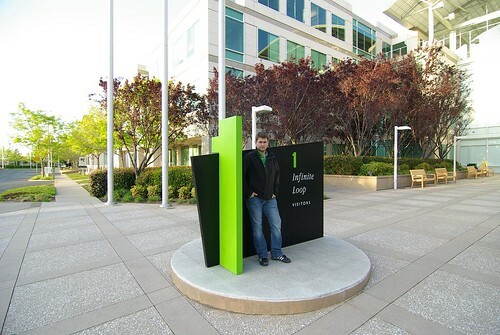 The drive was mostly uneventful, but that night I did visit One Infinite Loop for the first time! The next day, I dropped off the rental in SF and Caltrained it Palo Alto where I decided to visit the Stanford University Campus. I’m blown away. Waterloo will have a very difficult time to even be able to start comparing to that awesome university. The sheer size and construction of the buildings is impressive. Many of the buildings are built with stone, and look like they are built to last hundreds of years. Unfortunately the Hoover Tower was closed, so I was not able to get some shots from high up, but I heard the view from up there is pretty decent. After, I met up with some more Waterloo Co-ops working in Cupertino at Apple. We purchased some Apple swag at the Campus store before enjoying dinner. 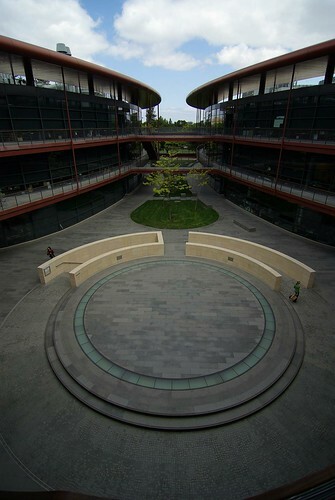 The Apple Campus Store, also known as the The Company Store was an interesting visit. 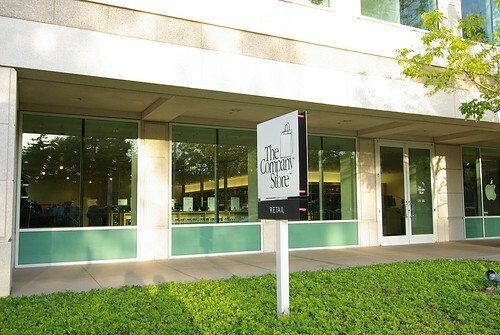 According to their website, it is the only store in the world where one can purchase official Apple branded clothing or accessories such as pens, coffee mugs, water bottles, etc.. I ended up coming home with two steel water bottles, a mug, and a t-shirt. I’ll keep one water bottle and a mug, but will likely pass the other water bottle to my sister or mother. My last full day in California was a relaxing one. While my host spent the day working, I woke up late after a night of much needed rest and hit up a mall in San Jose for some summer clothes shopping. After my friend finished work, we went back to The Company Store where I bought nice Incase laptop slingbag. At the eng of the day, we enjoyed a pitcher of BJ’s Nutty Brewnette beer then hit up a hot tub. It has been a LONG time since I last hot tubbed it, and I must say, I forgot how relaxing it can be. My flight leaves in approximately four hours aboard WestJet which will take me through Calgary before landing in the final destination of Victoria at around 9:30 pm PST. This flight will mark the 12th time I’ve flown to Victoria from Toronto, and 32nd flight ever – well depending on how well my memory is serving me. Probably my most memorable experience flying occurred this past August after traveling to Rome for a summer trip to Italy. We flew on the low-cost airline Zoom. Upon arrival at YYZ for check-in we discovered our flight was delayed for 12 hours due to “technical problems”, and would leave the next morning at 6:30 am. We did end up leaving at the re-scheduled time aboard a half empty 767, and arrived very late in Rome. After getting our rental car, and a three hour search for our hotel, we finally settled for the night. The next day, just before dinner, I discovered we weren’t flying Zoom home to Canada after our trip. My routine browsing of news.google.ca led to the discovery of Zoom ceasing operations stranding would-be fliers, including ourselves. Of course, we had time to plan a way back to Canada, and ended up taking three flights on three different airlines: Catania->Rome->London, UK->Toronto. Anyway, not too much time left to go before I need to leave, so here are some images that I have taken over the years from airplane windows. 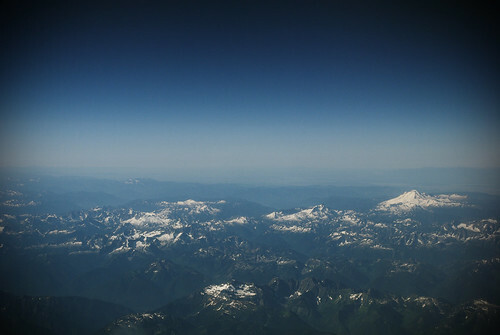 August 5, 2006 – Victoria -> Toronto. 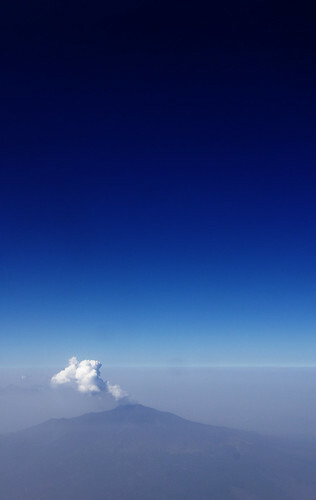 September 6, 2008 – Catania -> Rome. August 14, 2007 – Toronto -> Victoria. I’m typing this post in the final hour of sitting in the room I have lived in for the past four months. All my belongings have been packed away in boxes sitting on the floor just waiting to be moved to the truck for the short trip to Barrie. Another school term is complete meaning only another 5 to go. 3 years from now, I hope to be sitting in front of my laptop writing a post with my Iron Ring snug on my pinky finger. With the term over, here are few things I am looking forward to in the coming weeks. My bank account flush with tax-return cash, I have decided to take a short trip from April 24-30 to visit some friends currently on Co-op down in California. Although this trip is short, I hope to succeed being a tourist in such destinations as: Cupertino, Los Angeles, Palo Alto, San Diego, and San Francisco. Although I do not plan on commenting much about employment on this website, I will be starting a new job May 4 in Victoria. I never thought I would have been able to land a Co-op placement in Vic – especially in these “tough economic times”, but somehow I did. This may seem odd; however, I can not wait to mow the law back in Victoria. I have not lived at my childhood house since August of 2006, thus have not had the chance to push a lawn mower across green space since. I find the mix of summertime, gasoline, and the smell of freshly cut grass very intriguing. The first post in my newest online endeavour titled in true programmer fashion. I’m choosing a basic design for the time being for this blog until I have the time to mess around with the power that is wordpress. Until then, please mind the default links on the side! I want to delete them, but I need to definitely go through them and figure out what useful information I can gather from them. That’s it for now. I’m heading out to go enjoy my last night in Waterloo until September.